We recently surveyed 1,000+ SMB marketers on their content activities. 80% claimed they invested time to maintain a blog, which is great. Creating content is now an accepted necessity, especially for small and medium-sized businesses who need organic traffic to get noticed amongst their competitors. Blogging can be challenging, I’ll give you that. Creating impactful content regularly for your audience takes time, money, and the added burdens of optimization, finding the right image, title, etc. But creating good content is not enough: you have to invest part of your content marketing efforts towards optimizing the full content marketing cycle. What happens if you don’t ? This number is scary in another way: it means that over 50% of posts are not even shared twice on the social channels of their own companies. Learn how to optimize the full content marketing cycle the right way. 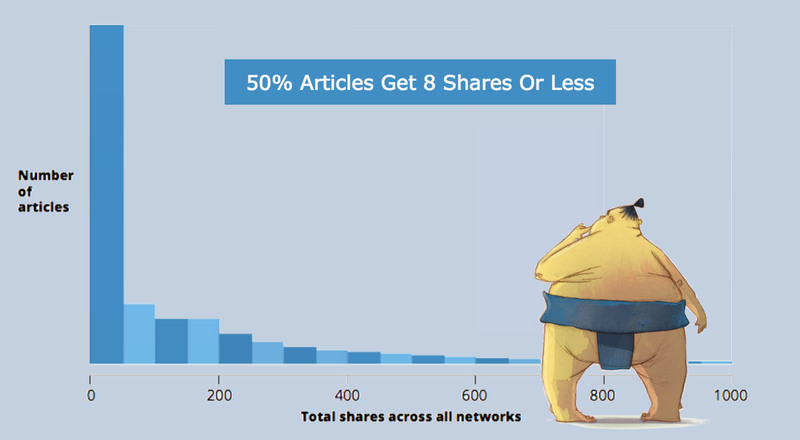 Sharing posts multiple times – low hanging fruit to maximize your content reach? Why spend so much time creating content if it’s left to die immediately after? Imagine if radio stations had played Michael Jackson’s Billie Jean only once: would it have still become the 80’s biggest hit? Probably not. The same analogy can be made with your content. If you want it to stand out among the others and go down in the rockstar hall of content fame, you have to promote it more than once. But let’s continue with this music analogy: when was the last time you heard Billie Jean on the radio? Probably not in the 80’s, right? So just like back-catalogue golden hits get played over and over again, your successful evergreen content should be re-shared over and over again. 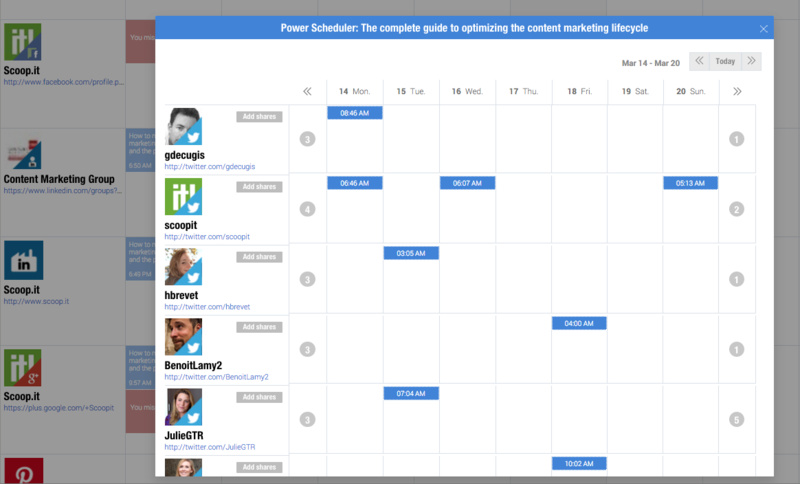 It’s complicated: programming 2 blog posts per week on 6 social channels (yours and your company’s) means maintaining a backlog of 48 social media posts to publish after just 4 weeks (= 2 posts x 6 channels x 4 weeks). Risk of over-doing it and creating audience fatigue from failing to keep track of your sharing history: nobody wants to lose followers in the process. The only reason we still hear Billie Jean today is because the song is really great. In order for you to re-share evergreen and successful posts, you need a system that allows you to identify success in a way that is simple, fast and efficient. Today, we’re excited to introduce a new feature that will solve all of the above problems and enable 100% of marketers to leverage smart, organic content distribution to maximize their content reach: our new Promote feature. This new feature gives you incredible leverage and control because these distribution techniques depend exclusively on you: no promotion budget needed, no favors to ask of anyone. Simply click on the calendar cells to add new shares. The calendar view gives you full control and visibility to ensure you’re not overdoing it. Figuring out the number of leads generated by each and every one of your blog posts can be quite complex. We’ve actually created a guide on this, but have taken things a step further here: we’ve built this natively into Scoop.it Content Director so that it becomes accessible to other parts of the software such as our new Promote feature. 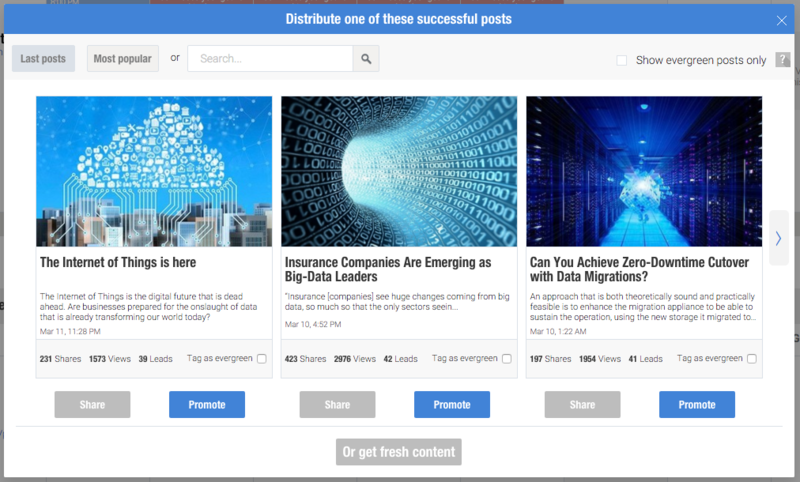 Each of these posts is displayed with the traffic, shares and leads it generated since Scoop.it Content Director tracks this information on a post-by-post basis. You can then easily click on each of the calendar cells to create corresponding shares or click on ‘Add Shares’ to program multiple shares at once for this particular channel. The number count on the left of each social destination tells you how many shares have been planned the weeks before this week and the one on the right counts all the shares scheduled in the upcoming weeks. That way you can make sure not to overdo it. With the Promote feature, content is automatically scheduled based on your goals as with the “Auto (based on goals)” option. Instead of adding shares one by one, you can create an entire program of multiple shares for multiple channels to maximize the reach of your content while making sure you’re not over-sharing. And of course, you can revise and fine-tune your posts by clicking on any blue box that represents an upcoming share. 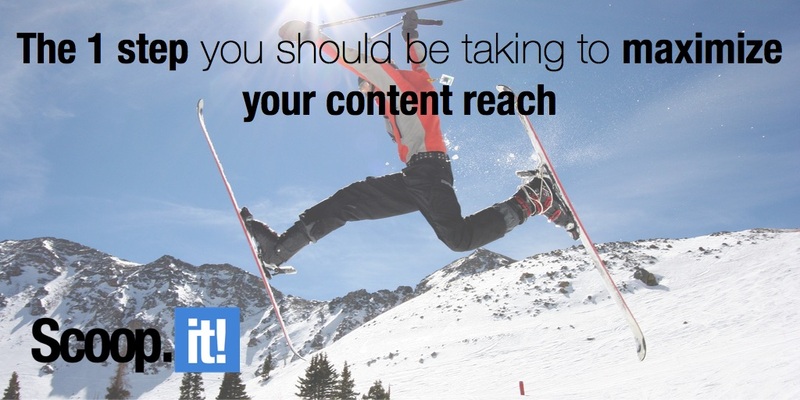 So, are you ready to maximize your reach and leverage your organic content distribution to its full potential? We hope you enjoy the new Promote feature and look forward to hearing your feedback in the comments below!